Baseball is American’s past time, right? Whether you play or are a fan of baseball or softball, this new stained glass home plate project is for you! But there is more to this than just an homage to these sports. Let me tell you the story. Every summer, I go to ‘Camp’ Camp, a week long summer camp for LGBT adults which takes place in Maine. It’s the base for a community of people which may have originally come together at random, but form strong friendships which are active all year round. One of our Campers, Eden, has been fighting kidney disease for many years. In June 2015, she received a kidney transplant from a living donor, and got a new chance at life. And then in early January of 2016, health complications arose and have knocked her for a loop ever since. She’s a good friend, and I wanted to find a way to help. Eden is a passionate fan of the Red Sox, so after some thought, I came up with the idea of this home plate project. The plate itself is white, of course, and there’s a border around the piece which can be used to alternate any team’s colors, or be any color combination at all. Over the home plate itself, I can add a variety of words in hand manipulated 20 gauge wire. I’ve done ‘play ball’ on a number of home plates, as well as ‘go mets’, ‘go nats’, ‘go sox’, and more. The possibilities here are quite numerous. Each plate costs $40 plus shipping. 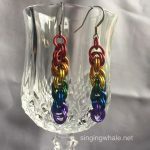 For each home plate sold, I am donating $15 directly to Eden to assist with her medical expenses as she continues her fight against kidney disease. I appreciate the support of everyone who has bought a home plate piece so far, and am keeping open a ‘made to order’ listing on Etsy to facilitate additional orders. What would you like on your home plate? What team colors are your favorites? 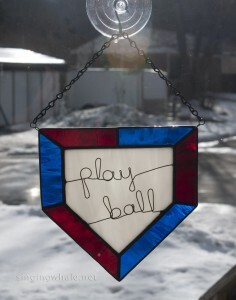 This entry was posted in misc, suncatcher and tagged baseball, home plate, softball, wire words. Bookmark the permalink.